Autumn is a wonderful season to indulge in rich fruity cakes. Fruits of the season like apples or pears make for wonderful sweet treats that everyone will appreciate. 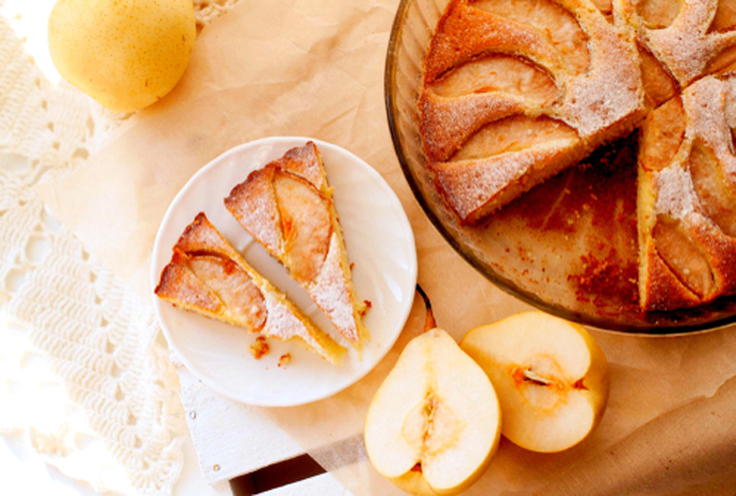 We’ve made this extraordinary, utterly delicious pear cake with esti extra virgin olive oil and believe us, it’s one of the best cakes you are going to make this fall! This entry was posted in Around the Greek table, THE ART OF LIVING WELL / and tagged autumn, cakes, greek pastry, Greek yoghurt on 8 October, 2018 by George Papageorgiou. 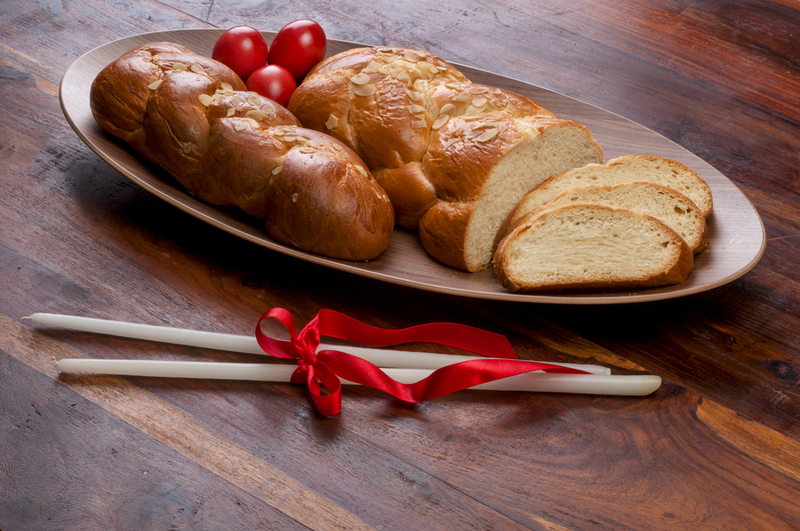 This year, Greek Orthodox Easter is on May 1st, right in the heart of spring! It’s the best time, weather wise that is, to celebrate a feast in which the Greeks are so much dedicated. Which means, that yes, Easter is the Greeks’ favorite religious day! This entry was posted in Around the Greek table, THE ART OF LIVING WELL / and tagged cakes, Easter, greek pastry, tradition on 11 April, 2016 by George Papageorgiou. 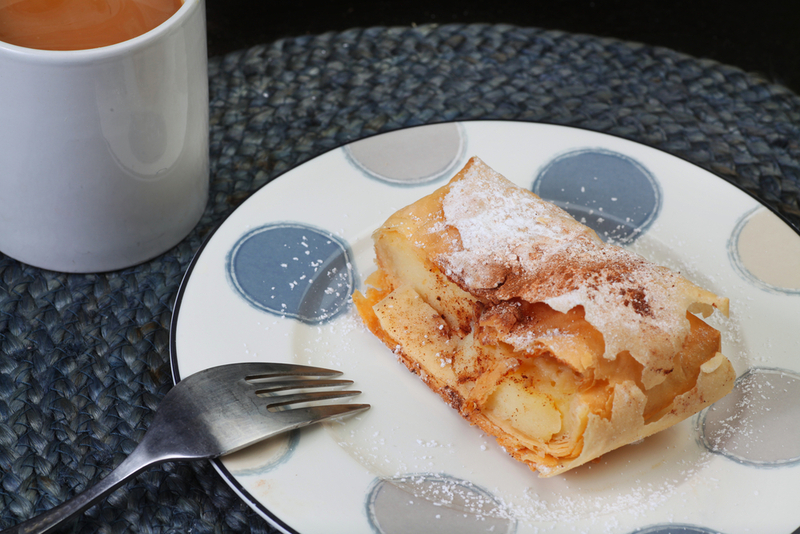 Baklavá is probably the most famous Greek dessert. Even though it is considered to be typical for Christmas, this rich, crunchy, syrupy delicate pastry can be found in every pastry shop all year round in the country. More or less it is made in the same way, preferably using walnuts in the filling. A combination of walnuts and almonds is also frequently used. This entry was posted in Around the Greek table, THE ART OF LIVING WELL / and tagged greek pastry on 17 December, 2015 by George Papageorgiou. 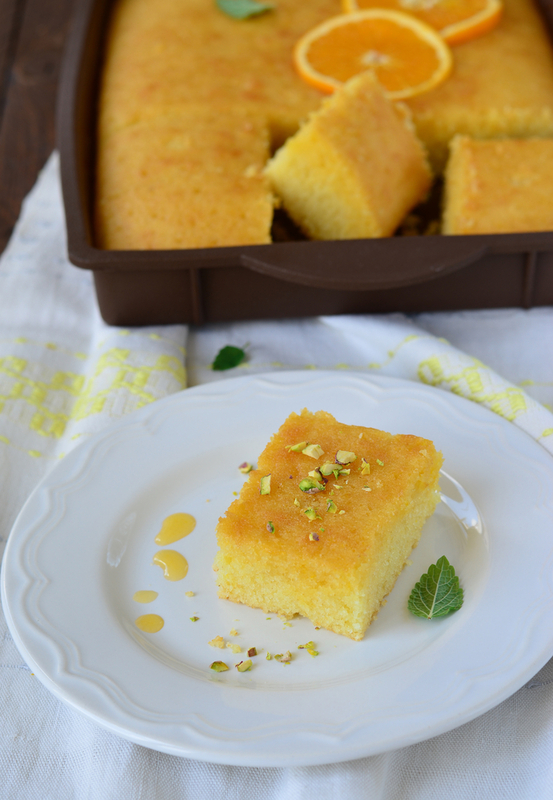 This is a lovely fragrant cake, typical of Greek cuisine, usually made in winter when orange groves are full of juicy, sweet oranges. This entry was posted in Around the Greek table, FROM GREEK HOMEMAKERS /, THE ART OF LIVING WELL / and tagged cakes, greek pastry, pudding, tradition on 7 December, 2015 by George Papageorgiou. 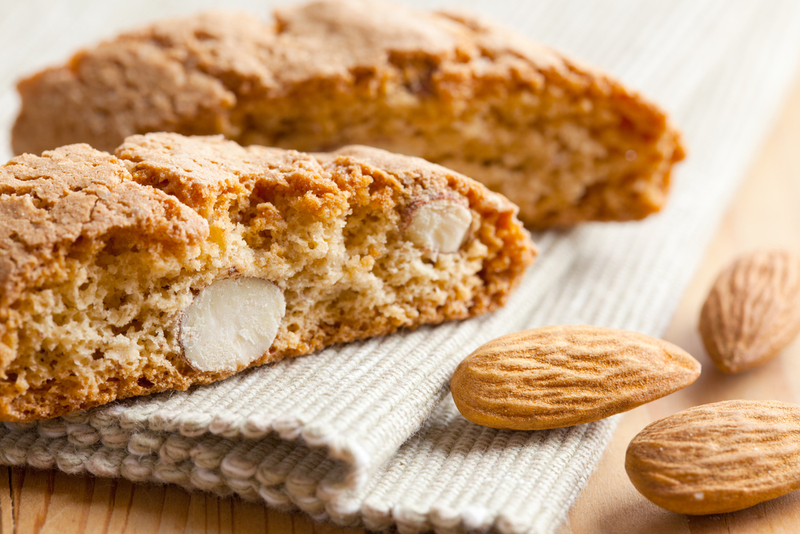 Biscotti are lovely biscuits, a bit harder than the usual biscuits as they are baked twice, hence the origin of the word from the latin phrase bis coctus- twice baked. In Greece we call them “paximádia”. We not only make sweet paximádia, but also savory ones. Today we’ve got the most popular version. 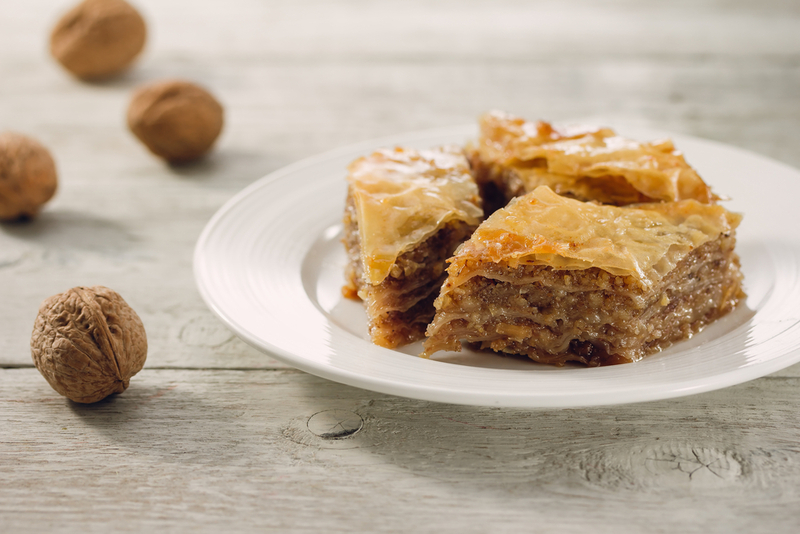 Paximádia that are flavored with Greek ouzo and made even crunchier by adding almonds! This entry was posted in Around the Greek table and tagged cookies, greek pastry on 14 January, 2015 by George Papageorgiou. Galaktoboúreko is a Greek dessert, probably the most popular in the country, often served at feasts, such as birthdays, name days, Christmas etc. It has almost all the elements that characterize Greek pastry, which means that it is a syrup based dessert made with phyllo sheets. Yet what makes it unique and tremendously popular is the wonderful luscious custard cream that is spread between the layers of the phyllo sheets drenched with abundant lemon flavored syrup. This entry was posted in Around the Greek table and tagged greek pastry on 24 January, 2014 by George Papageorgiou. 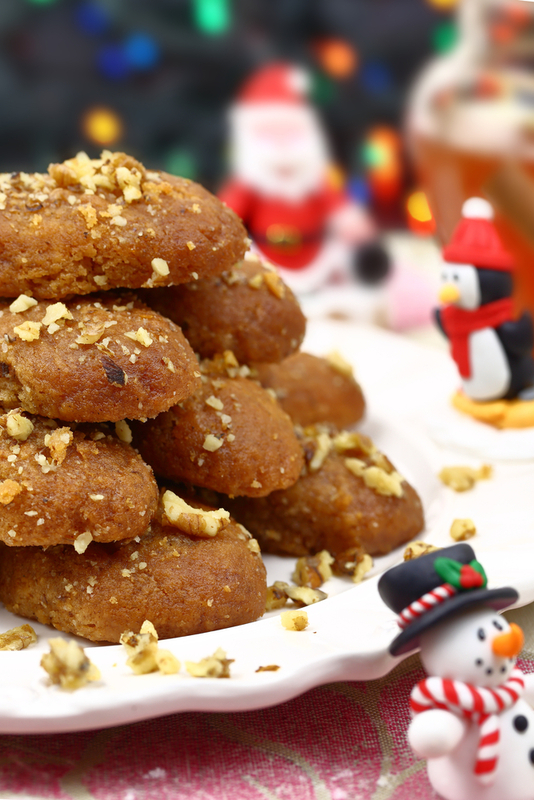 Melomakárona is the name of our traditional Greek Christmas cookies. They go back in time, in Ancient Greece, when they were usually served after a funeral. But those cookies were made without honey, whereas the ones we eat today are dropped for a few seconds in a syrup made with honey. Thus the first part of the word “melo” deriving from the word “méli” meaning honey in Greek. This entry was posted in FROM GREEK HOMEMAKERS / and tagged Christmas, cookies, greek pastry, tradition on 27 December, 2013 by George Papageorgiou.